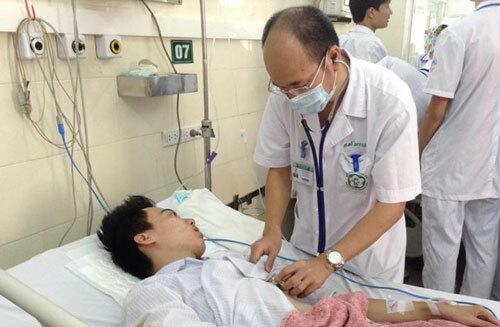 HA NOI (VNS) — The Ha Noi–based Bach Mai Hospital yesterday warned about the risk of dengue patients developing encephalitis, a rare complication. The warning comes after the hospital received a 23-year-old student of the University of Civil Engineering who had encephalitis-meningitis caused by dengue fever. "Ha Noi has recently seen an increase in the number of dengue cases with a total of 1,500 people being hospitalised," Deputy Chief of Bach Mai Hospital's Infectious Disease Ward Do Duy Cuong said. "However, such a case of encephalitis-meningitis, caused by dengue infection, is a rare complication," Cuong said. "The patient was hospitalised in a critical condition, with seizures and impaired consciousness. If he had not been diagnosed and treated promptly, his life would have been threatened," Cuong said. The patient regained consciousness after just two days of treatment, he said. Cuong said dengue fever was an acute infectious disease common in tropical countries. Most patients are young adults living in densely populated areas and in poor sanitary conditions. The most common type of mosquito transmitting the dengue fever virus is Aedes aegypti. Dengue symptoms include sudden and continuous high fever, lasting two to seven days, with temperatures rising to 39 degrees or 40 degrees Celsius, severe headache, rashes and lymphadenopathy, as well as nosebleeds, bleeding gums, vomiting of blood and tarry stools (caused by bleeding organs). Female patients may suffer menorrhagia.